When searching for the best crappie rod and reel combo, you want to prioritize casting distance and rod sensitivity. However, type of bait and reel also play a part. To learn more, join us as we tell you everything you need to know about crappie fishing combos! What Spinning Combo is best for Crappie? Spinning rod and reel combinations are a popular way to catch crappie. Why? They are by far the easiest way to catch this fish. Some might say the most effective. We will leave that up to you to decide! If you plan to use artificial lures in shallow water, spinning combos might be your best option. However, there are different levels of power, action, and gear-ratios. It can be confusing! That’s why we’ve put together the necessary ingredients for a the best crappie rod and reel combo. Medium action works best. You want something middle of the road that can cast far yet give you the greatest sensitivity. Favor a slow action rod if you want a longer cast. For more sensitivity, fast action is king. 4 to 5 feet is a good length. You don't need anything excessively long to catch crappie. However, the most important guideline is to find a length that suits your body type and allows you to feel comfortable. Great for Winter Spawning. A light spinning combo works well for catching crappie during the spawning season. Even the heavier ones! If you are interested in fishing during the spring, check out a fellow crappie fisherman’s tips and tricks. Reels should be as light as possible. The fish you seek are not very heavy, so there is virtually no risk of the line snapping. Light and ultralight reels are more sensitive to movement and are better for casting light bait. Reels should have a fast gear ratio. The faster the gear ratio, the quicker you get your freshwater fish hooked! This feature lets you work the jigs the way you want without making a lot of commotion. You don’t want to scare the crappie away! Watch this extremely helpful video from Richard Lee on how to catch a carp. He not only gives you tips and tricks for lures and bait, but he also shows you what goes on under the water! What Baitcasting Combo is Best for Crappie? If you want to dip, drift, or troll, then you may be interested in purchasing a baitcasting combo. On spinning reels, the line is wound. On baitcasting reels, the fishing line is parallel. That makes it easier to drop your lures straight down into the water. Fast action works best. With panfish like crappie, the best rods are the most sensitive. The faster the action, the quicker you can respond to a nibble on your line. 6 to 12 feet is a good length. Anyone planning on dropping their line to catch crappie will want a length of at least 10 feet. The length allows you to reach as deep as the fish! Shorter rods are best used for trolling or drifting. Reels should be as light as possible. Like spinning reels, baitcasting reels come in a variety of sizes and weights. We recommend going with the lightest one you can find down to a 4-pound test line. They are easier to cast. Graphite is best. Regarding construction materials, graphite is the best. Why? Because it is the most sensitive to fish nibbles! That is important when fishing for any panfish. Can You Use a Cane Pole? Cane poles are not used very often these days. However, they are still extremely useful for dropping lures in tight places and near old structures. Since crappie hang out under fallen trees, narrow channels, and other deep areas, a cane pole can be just the thing. If you are considering an old-fashioned cane pole, we have put together a list of what to look for. Fast action works best. Sensitivity is important, even and especially on cane poles! A fast action tip will allow you to feel any action on your lure. 12 to 20 feet is a good length. Since you are dropping your bait down into the depths, you need plenty of rod length. In fact, cane poles are balanced so you can feel the bite while casting as far as needed. The short answer is yes. In fact, this is the type of reel most people prefer because it is the easiest. However, spincasters do not cast very far or very smoothly. These reels are also the hardest to manipulate bait with. That is why we don’t recommend them. However, you can find dedicated anglers that swear by using spincasters during the winter rush. UglyStik is from a reputable fishing gear manufacturer. They make high-quality combos, and the GX2 reel and rod combo is no exception! It was made from graphite and fiberglass to give it the best of both worlds. 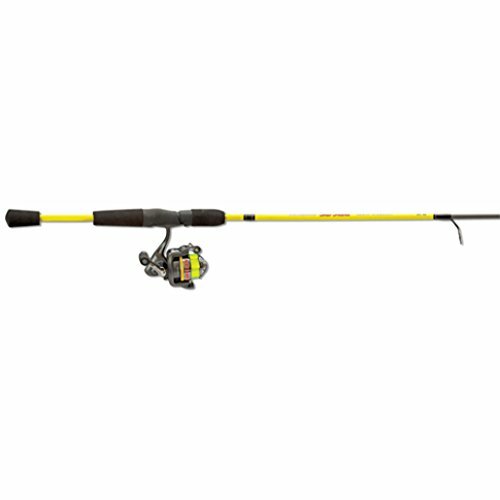 The rod is covered by a 7-year warranty and the reel for one year. The GX2 is a medium action spinner, meaning the casting will be a breeze. The test line is a cool 8-20 pounds so that you can catch any monster crappie. Remember to buy a lighter line if you want even more casting power. This UglyStik is 6 feet long, so it falls within a good length for a spinner. The reel has four ball bearings, and these work to make your catch smoother. The rod comes apart into 2-pieces, making it easier for carrying in a backseat or keeping in a small space. Of the best crappie rod and reel combos on our list, the Mr Crappie Slab Shakr is the best value. 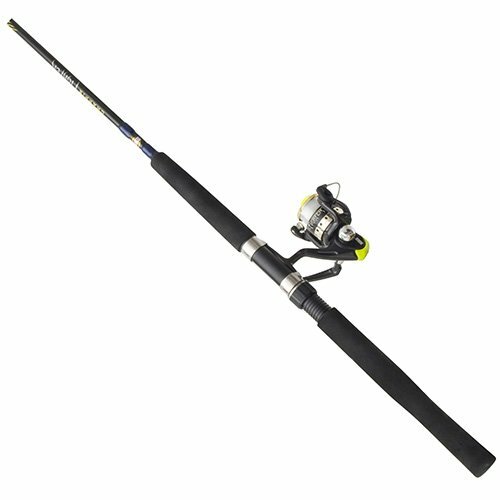 This combo combines a strong graphite rod, reel seats, and reel with stainless steel guides and inserts. This makes the Mr Crappie Slab Shakr a great combo to use in all water types. If you are a beginner, Lews makes it easy. They have pre-spooled the combo with their premium line! Small spaces or a 2-door car? No problem! 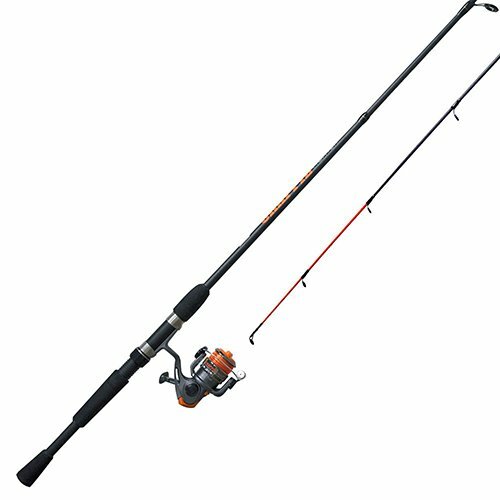 This rod and reel set comes apart into two pieces for easy carry and storage. The length of this Lews rod is 5 feet and 6 inches. As a spinner, this is the perfect size to cast effortlessly. We recommend the Slab Shakr for lightweight lures. However, with the line provided, you can catch any fish up to small or medium-sized bass. If you want to cast well, you want the longest rod that feels comfortable in your hands. 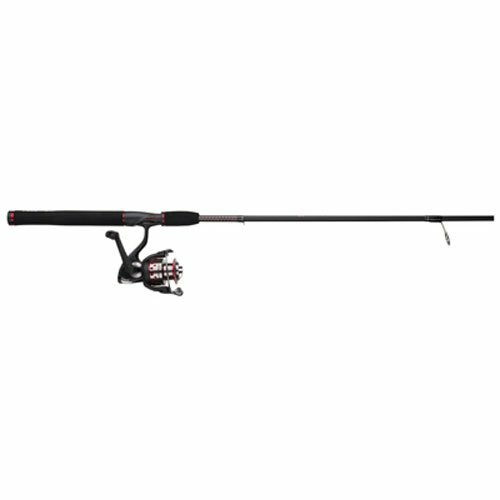 Our pick for that rod is the Zebco Quantum Crappie Fighter. This rod is ambidextrous, meaning anyone in your fishing party can use it. We can attest that it is comfortable either way! This is a spinning combo, so having a high gear ratio and balanced bearings are important. Luckily, the Quantum Crappy Fighter gives us a 4:3:1 ratio as well as one bearing for a 4-8 pound line. The rod gives you 8 feet of room to drop your lure and bait, and it is made of durable glass. The spool is chrome plated, and the reel is ultralight to give you easier casting. With a retrieval rating of 18 inches per spin, you will have your fish off the hook before they know what hit them! The original Crappie Fighter is less confusing to use than the Quantum, which is why we named it the best crappie rod and reel combo for beginners. Zebco made sure to start new anglers out with a medium action, but feels as smooth as a lightweight! 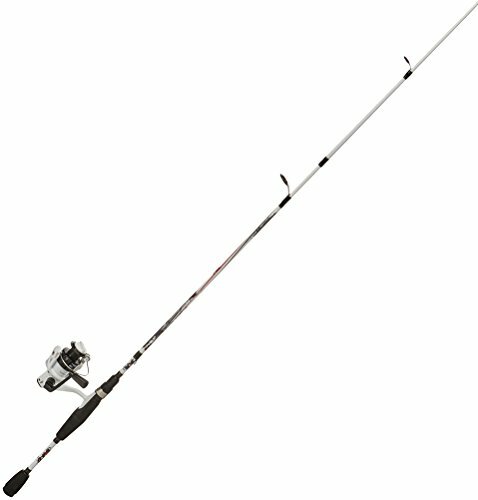 It is a spinning rod, yet you can purchase it in any length up to 12 feet. What that tells us is that this spinner can do double duty for drop, troll, or drift techniques. You need to play a bit with your ball bearings and line. For anyone a bit smaller, 10 feet is also an option. The 8-foot rod comes apart into three pieces so that we would recommend it for anyone with smaller quarters and transportation. It can also make hike-ins and overnights much easier! The rest are 2-piece and come in more spinner-like lengths starting at 5 feet and 6 inches. The Abu Garcia Ike Dude is a fast action spinner that is also available as a spincast. For crappie fishing, we will only cover the spinning combo. The composite blank and reel are both lightweight, as are the stainless steel line guides. As a nice gesture, Abu Garcia included pre-spooled, 6-pound line. Perfect for getting right out there and catching your first crappie fo the year! Although advertised as a medium action spinner, it is as stiff as a fast action rod. This makes it handy for drift or trolling. Concerning comfort, the Ike Duke features a cushy handle made with high-density EVA. It even lets you set the drag for smooth reeling. You can use this combo on crappie as well as other panfish. You can even catch medium-sized bass with the right line!